Picture this: you are the logistics director of Switzerland’s largest supermarket chain tasked with distributing goods to thousands of stores across the country. You have many different types of vehicles in your fleet and many routes to use. What can you do? This was the situation Swiss supermarket giant Migros faced in 2002, leading the retailer to ant colonies for inspiration. When ants forage alongside thousands of others, they can find the shortest, most efficient routes to food despite their relative weakness as individuals. Modelling Migros’ transport problem as foraging ants provided near-optimal daily delivery plans for 1,200 trucks in 15 minutes, as opposed to days with deterministic algorithms. The ant-inspired method also accounted for different vehicle types and provided better capacity utilisation. Research into the behaviour of ants, bees and other social insects has resulted in novel solutions to optimise business processes. Though individually weak and unintelligent, these insects can form impressive structural mounds, forage effectively and divide labour efficiently when working as a group. By following simple rules, their collective behaviour yields useful work despite a lack of supervision or central command. This behaviour is called ‘swarm intelligence’. While businesses often strive for the first two characteristics, it is the self-organising nature of swarm intelligence that managers find hard to adopt. However, there is much to learn from this trait. With self-organisation, solutions emerge organically rather than being rigidly pre-defined, with creative applications in optimisation. The idea that an army of ants can exhibit complex behaviour by only following simple rules underlies how swarm intelligence works. Consider the following situation. A predator (or aggressor) is hunting its prey, but a ‘protector’ stands in between. The predator and prey move in such a way that the protector is always between them (see fig. 1). If there were hundreds of creatures nearby, all having an aggressor and protector and following this simple rule, then they will all never stop moving. However, if instead, each creature had another creature to protect (see fig. 2), the whole group would eventually clump to a standstill. Fig. 1: you keep a designated person between you and a specific aggressor. Fig. 2: you stand between two designated others. In both cases, each creature followed the same simple rule. The first resulted in complex and chaotic behaviour, while the second differed very slightly, yet resulted in an entirely different outcome. An example in small business is a sales incentive scheme, where just one or two simple KPIs can lead to productive, desired behaviour. For example, basing commissions as a percentage of revenue generated will motivate sales team members with a core focus. Such a KPI drives staff to align their behaviours at intermediate steps with their overall goal – from working with leads, making calls and closing sales. The foraging behaviour of ants has inspired solutions in vehicle routeing (like with Migros), telecommunications, cargo transport and other supply chain processes. By following some simple rules employed by ants, it is possible to achieve optimal or very nearly optimal paths. Suppose that there are two ants. They start from the same nest but travel along different paths to the same food source. As they walk, they release pheromones, a chemical marking their trail which other ants can detect (fig. 3). 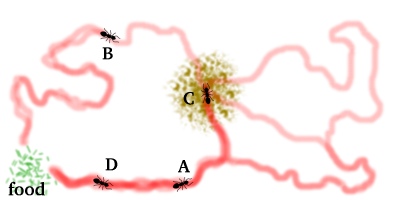 All else being equal, the ant along the shorter path will return first, having covered its trail with twice the amount of pheromones than the other route. This would attract other ants in the nest to follow the shorter path. Over time, it would get more marked and traversed than the longer one. Pheromones will eventually evaporate on the longer route. Fig. 3: ants leave pheromones where they travel, marking their trail. The analogy to vehicle routing for a food delivery service is the clearest to see. However, in the same way, one can model data packets over the Internet as ants. These packets get from one place to another by traversing a landscape of paths, represented by fibre optic cables and servers. With digital ‘pheromones’ that can be programmed to evaporate after a given period, packets can leave traces along routes that allow Internet providers to gauge their optimality and manage demand. Similarly, telecommunication companies can determine the shortest paths between reception towers for mobile users and manage traffic flow, even as demand changes in real-time. In a small business context, this also applies to job scheduling, such as finding the most efficient way of assigning jobs to employees. When a manager first hires a group of workers, they might assign any job to any employee. Over time, specific employees will excel at certain jobs, a pheromone-like signal for them to specialise in that area. By being more aware of different employees’ strengths, one can more accurately choose the right person for complex jobs, and efficiently assign jobs that the business has never done before. Harvester ants transport food from a source to their nest in a relay fashion. The sandwich franchise Subway is a retail example – one person prepares the bread, another picks the meat, and a third selects the salad. In a variation of a method known as zone picking, several relayers or ‘pickers’ are sequentially assigned different parts of an order to pick – or sandwich portion to make – but can’t start picking until the previous picker has finished. This rule is problematic because faster pickers are underused while slower pickers are unnecessarily frustrated, leading to inefficiencies and congestion at different points in the chain. In contrast, harvester ants employ another method known as a bucket brigade, where they form a line to relay food to their nest (fig. 4). The ant at the food source carries a seed along until it encounters the next ant in the line and hands it over. Each subsequent ant takes the seed from the previous ant and passes it on. Ultimately, the last ant deposits the seed in the nest. Fig. 4: ants are forming a bucket brigade, with each ant covering some portion of the whole path. In the 1990s, researchers conducted a study at a large distribution centre at Revco Drugstores, which employed the zone approach. Borrowing from the bucket brigade method, they implemented a new rule: each worker was to continue picking until the person ‘closer to the nest’ took over their work, at which point they were to head back to the previous person – ‘closer to the food source’ – and take over their work. The new method increased throughput by 34%. In the Subway example, this would involve the salad picker helping out with the meat once they had no more salads to make, and the meat picker helping out the bread when there was no more meat to prepare. This differs from the zone approach as the zone boundaries of ‘bread’, ‘meat’ and ‘salad’ are blurred. With all pickers following this rule, no one would ever be out of work, and the faster workers would help the slower ones. One can apply the bucket brigade concept to employee utilisation in the different stages of a customer journey, especially in the early stages of business growth. Raiding the ‘food source’ is the equivalent of acquiring leads. These are passed from the sales team to the marketing team, then to the product team and finally the accounting team. When one team has capacity, they can look to adjacent teams to help. It is then beneficial to develop skills in adjacent teams, a characteristic that is prevalent in newly formed businesses. Ants and other insects have shown time-tested methods of efficient and dynamic self-organisation resulting in optimised outcomes from simple rules. Their collective behaviour inspires many other applications, from bankruptcy prediction to nanoelectronics. From foraging to labour division and more, swarm intelligence is a radical model of organisation that has much potential for businesses to explore. What organisational structures do you use within your business? Let us know on Twitter or LinkedIn.